After the huge success of Kleptocats, Hyperbeard games have come up with an exciting new combine-to-create game. Alchademy (Alchemy + Academy) lets you mix ingredients straight out of a wizard’s spell book to create new ingredients and if you are lucky you might get that rare “creation” that only a few alchemists can ever dream of creating. You will be dropping two weird ingredients into the cauldron, press the mix button and create something as awful as the other two. The newly created object will be added to your book. You will have to mix and collect all ingredients plus creations to unlock a new book. Alchademy draws inspiration from Doodle God, but the alchemy theme perfectly fits the overall concept of the game. There are some really fascinating creations you can make and share them with your friends via social networking sites. Here’s a helpful walkthrough for those who have just started playing the game. It also contains a few tips and hints for earning coins and all possible combinations. 1. Drag two different ingredients into the cauldron to create a mixture. The mixture could be an ingredient or a creation. Tap the mix button at the bottom of the screen to start mixing them. A creation can’t be mixed with an ingredient or a creation. Creations are rare, prized possessions that are displayed in hangers underneath the second rack. 2. You start with three basic ingredients: Fire Blood, Weed Lips and Orc Berries. You will have to take two ingredients from these basic objects to create mixtures, which could be newer ingredients or creations. After dropping two ingredients into the cauldron, you will have to wait for some time to get a new mixture. 3. At first it will take a few seconds to make something, but as you keep combining more and more objects, it will take more time to get mixtures. You can speedup mixing time by tapping the hourglass icon at the bottom-left corner of the screen. The hourglass remains faded until you collect 500 coins. 4. Tap the scroll to check the last five combinations. The medieval alchemy scroll saves time it informs you which ingredients you have used so far, so that you won’t have to use the same ingredients over and over again. The scroll shows both failed and successful combos. If you want to see only the successful ones, tap the book at the upper-left corner of the screen. 5. Keep an eye on the cauldron. It turns red for a few seconds when you drop the same ingredients into it. The cauldron turning red can save you precious time. However, if you fail to notice and mistakenly drop two ingredients which have already been used to make a mixture, you will still earn coins. 6. When you drop an ingredient, check those big reddish circles around the cauldron. The number of circles around the pot suggests how many new mixtures can be created using the ingredient. So if there are 4 circles around the cauldron, then you can create 4 new mixtures (could be anything, ingredient or creation) if you combine it with other ingredients. Circles will decrease every time a new mixture is created. 7. Tap the book icon at the upper left corner of the screen to check your creation and ingredient collection. A separate “Creations” page shows your prized possessions that you have created so far. You can unlock a new book once you have completed creating ingredients/creations mentioned in the first book. 1. When you create a new mixture, a share button appears just underneath it. Tap to share your new ingredient/creation and get 100 coins instantly. 2. When the druid or alchemist stirs the cauldron, a video option appears at the bottom of the screen. Tap it to watch a 30 second video to earn some free coins. 3. You can also tap the friendly ghost at the background to get coins. The screenshot below shows the friendly ghost behind the alchemist. He appears when there’s a free coins offer available. Keep tapping him and watch videos to get more coins. 4. Play the game every day to get daily attendance rewards. And don’t forget to tap the golden cat whenever you spot it. Tap the cat rapidly until it disappears to get lots of coins. 5. You also get coins every time you create a mixture. Regardless of what the end result is, you will still earn coins. If the cauldron throws a new mixture, a duplicate mixture or a failed mixture, you will earn coins. Sometimes, mixing two different ingredients does not yield anything. All you get is a lump of goo. Don’t be disappointed if the experiment isn’t successful. Every time a mixture fails, the lump sticks to the goo pile that suddenly appears above the screen. Every lump adds 10 percent to the mound. Tap the pile of goo when it reaches 100 percent to get lots of coins. 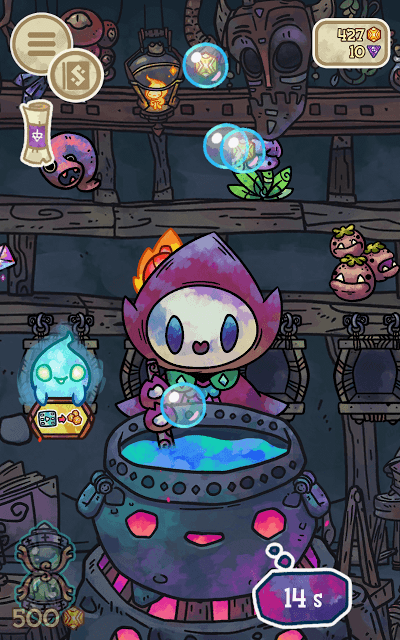 Tapping your alchemist will make him stir the cauldron as fast as he can, but that won’t speed up time. Instead, more and more bubbles may appear. When your alchemist stirs, bubbles come out of the cauldron. Some of them may contain coins. Tap those coins trapped inside bubbles to get them. Tapping the alchemist rapidly will increase the chances of getting coins trapped inside bubbles. This is because more and more bubbles appear when the alchemist stirs the cauldron faster. Doing this, you will find a coin bubble every after few empty bubbles. Combine the ingredient mentioned on the first column with the ingredient on the first row and so on to create new ingredients and creations. Creations have a different background color. A cell will contain the word “creation” within brackets.